So officially I’m a homeowner. Oh hi there, patch 3.3 in FFXIV. Logged in around 4:30 this morning to scope it out and my Free Company boss-lady asks me how much money I have. Before I start thinking she wants monies to get a bigger guild house (because a mess of new housing plots were added), it turns out it’s the other way around: she’s giving me money so I can get my own house, as a loyalty reward and also for my care and feeding of everyone’s chocobos. True, it’s a small house (a Cottage, if you must use the proper term) and it’s the same size as our guild house, but… it’s my house. Theoretically I could share with 3 other people; most likely one of them will be Bonnie if she actually cared about housing. Obviously, uh, I had to dye (paint?) 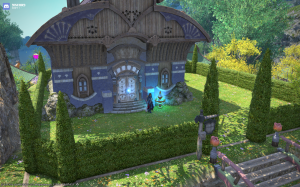 my house dark blue, and I made the bushy fencing and got an Aetherlyte so I can teleport back here, except there isn’t much else here (retainer bell, etc.) yet because I’m totally cleaned out of money. :P Tarrika’s going to be making a bunch of furniture on demand later today, I’ll see if I can get a Riviera canopy bed so I can replicate my bedroom from the FC house on a slightly bigger scale. Most likely I’ll keep Dodo stabled at the guild house to make it easier to mass-feed the chocobos. 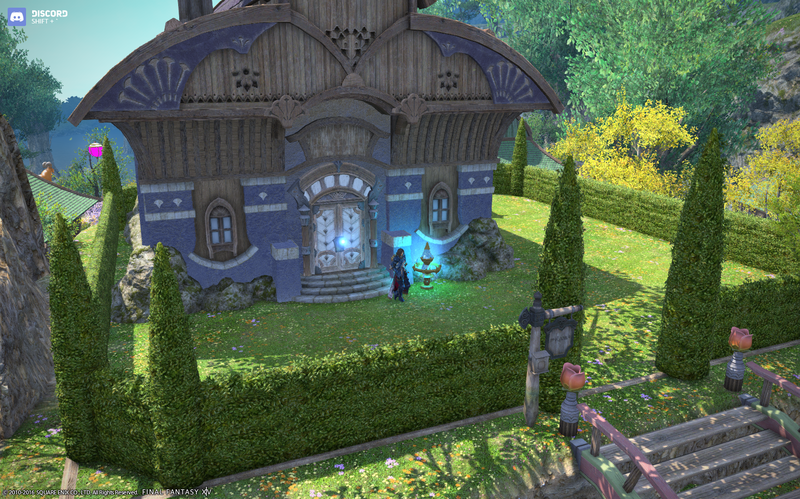 If you’re on Faerie server, my house is in the Lavender Beds, Ward 31, #56. This entry was posted on Tuesday, June 7th, 2016 at 9:14 am and is filed under journal. You can follow any responses to this entry through the RSS 2.0 feed. Both comments and pings are currently closed.